We have another great weekend of events coming up in the Triangle. Below are my picks of things to check out this Friday-Sunday. The weather should be nice and warm for the Raleigh St. Patrick’s Day parade this year. I’ll be there playing with my band, the Bulltown Strutters. No matter what you end up doing, I hope it is a great weekend! 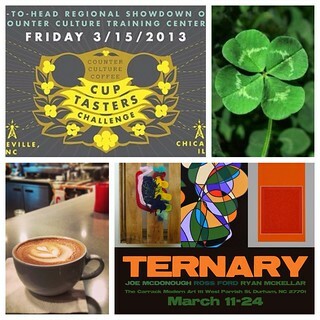 Coffee competition at Counter Culture’s Durham Training Center. Art show by three young abstract artists unified in their bold use of color and commitment to working in Durham. Monthly, open-air market with reclaimed, vintage furniture and trinkets from Bitty Boo Designs & Patna South, beautiful flower pots from The Contained Farmer, Crowns by Sarah, Whispering Willow soaps & Candles, Food Trucks, Carolina Roller Girls and much more!